An apple a day keeps the doctor away – at least that’s what they claim! 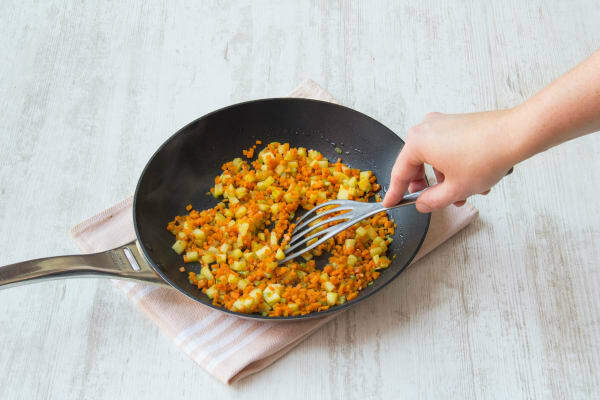 With carrot, celery, lentils and rocket added to the mix, this dish is absolutely loaded with both flavour and nutrition. Now for the decadent part... we have taken the finest pork in the land and glazed it (generously) with the sweetness that only honey can pull off and the warmth of mustard. You are in for a treat! Take the pork out of the fridge to come to room temperature and pre-heat your oven to 180 degrees. Peel and chop the carrot into tiny pieces (less than half a centimetre if possible). Slice the celery lengthways into strips less than ½ cm if possible, then chop the strips widthways into ½ cm cubes. Peel the apple and remove the core (the easiest way is to cut it in quarters lengthways through the core then cut the core from each piece). Chop the apple into ½ cm pieces. Next cover your pork fillet in a good pinch of salt and pepper. Heat 1 tbsp of olive oil in a frying pan on medium-high heat. Once the oil is really hot (gently) add in the pork fillet and cook for a couple of mins on each side until it has nicely browned off. 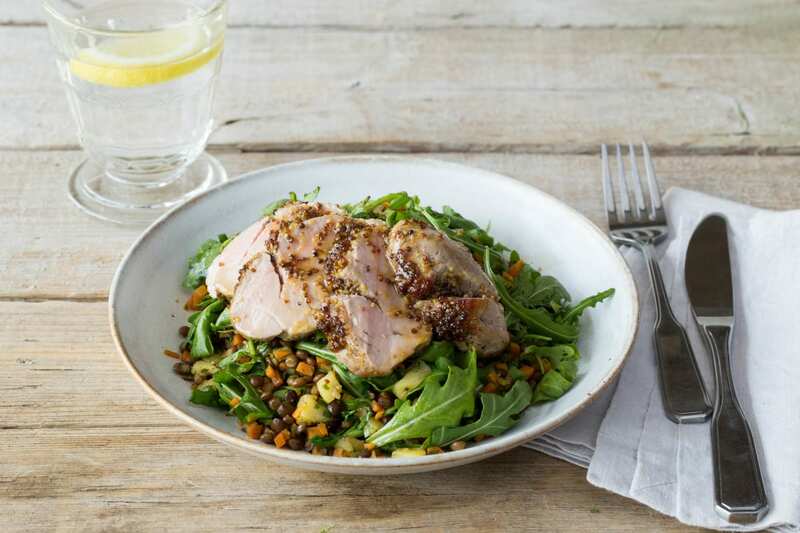 Mix together the honey and the mustard and spread half of it over the pork fillet. 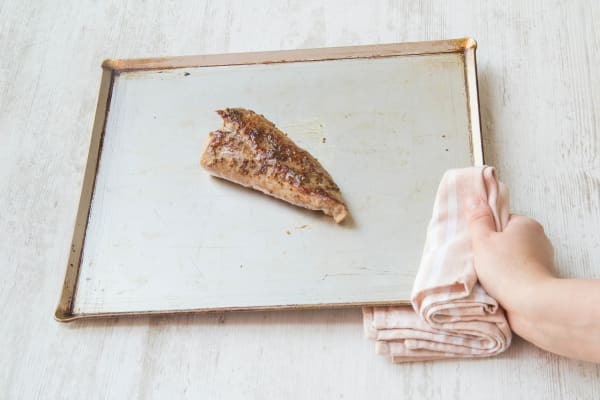 Transfer the fillet to a baking tray and cook in the oven for 12-15 mins (we prefer less time for a slightly pink finish). Keep the frying pan. While the pork is in the oven heat 2 tsp of olive oil in the frying pan you used for the pork on medium heat. 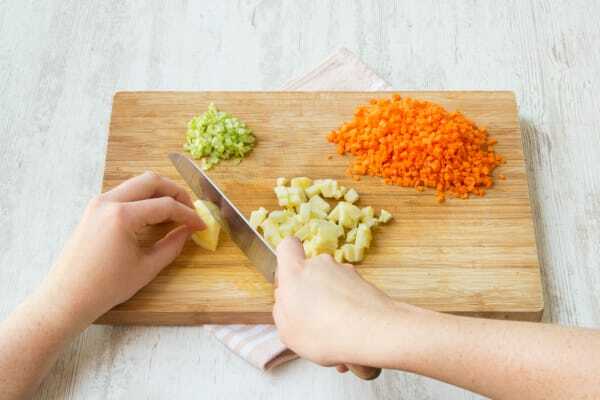 Add in the carrot, celery and apple with ¼ tsp of salt and a few good grinds of pepper and cook for 5 mins. 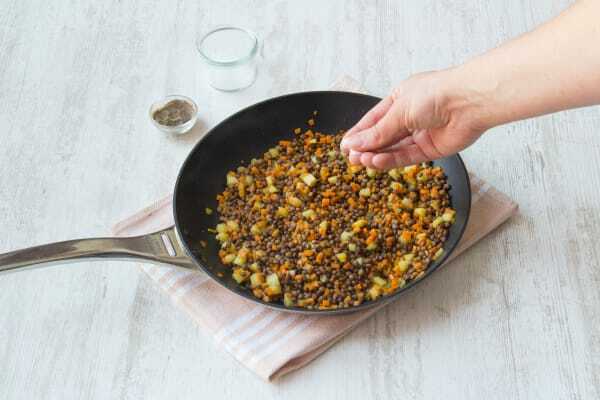 Drain and rinse the lentils before adding them to the pan. Gently stir everything together for a minute and then remove the mixture from the heat. Test the mixture for seasoning and add a little more salt if you need to lift the flavour. Very finely chop the parsley. Remove the pork from the oven and immediately pour over the remaining honey glaze. Leave it to rest for a few minutes to let the juices redistribute around the fillet (keeping it nice and moist). Once the lentils have cooled down, toss (or gently fold) the parsley and rocket through them. Slice the pork into around 8 thin slices and serve it on top, pouring any remaining juices and glaze from the pork over the dish.